June 16-30 still available! Pet-friendly cottage, short walk to beach! Come to beautiful, secluded, unspoiled Bald Head Island, North Carolina, a car-free environment that is a safe, peaceful family retreat and a romantic couples getaway. Our home is fully equipped for the perfect vacation. We are a short walk to a white sandy beach via the neighborhood's private boardwalk system. Our beaches are never crowded! The Milliken House has a wrap-around front porch with rockers, a porch swing and hammock for visiting with friends and family. Our rear patio has an outdoor, private, enclosed hot/cold water shower, and a propane grill. The first floor of our home offers an open floor plan with living, dining and kitchen areas, wood floors, nine foot ceilings, a half bath and a laundry closet with a full-sized washer and dryer. Our large gourmet kitchen has Corian countertops, a breakfast bar that seats four, glass-front cabinets, and a terra-cotta tile floor. The living area has a large-screen internet ready cable TV with DVD player and large supply of DVDs. The dining area features a beautiful, custom-made dining table and seats six. The second floor also has wood floors and nine foot ceilings, and has two large bedrooms, each with a king sized bed. The master bedroom has a small private deck facing south toward the water, a work area with desk, telephone, a small flat screen internet ready cable TV with a DVD player, a walk-in closet, and a private bath with double sinks and a large tub and shower. The guest bedroom has a king sized bed, a comfortable wing backed arm chair, a full-sized crib complete with crib linens and a bumper in the alcove, and a large closet. A second full bath, with tub and shower, is on the second floor in the hallway next to the guest bedroom. The third floor, with pickled pine floors and nine foot dormer ceilings, is a large bunk room with ocean views, two built-in twin daybeds under a row of west-facing windows, built-in bunk twin beds, and a futon couch that folds out into a double bed. This floor is set up for kids, with a small flat screen cable TV with DVD player, and lots of children's books, videos and toys. There's a large open area up here where the kids can spread out and play! We use a linen service in Southport as part of our cleaning service. All bed linens are high quality and professionally laundered, and all bed pillows are down-filled (we have allergenic alternatives available). We also provide professionally laundered large white bath towels. We have two newer four-seat Club Car golf carts for getting around the island. A membership in the Bald Head Island Club is included in the rental, and we can sponsor a membership in the Shoal's Club upon request for an additional fee. 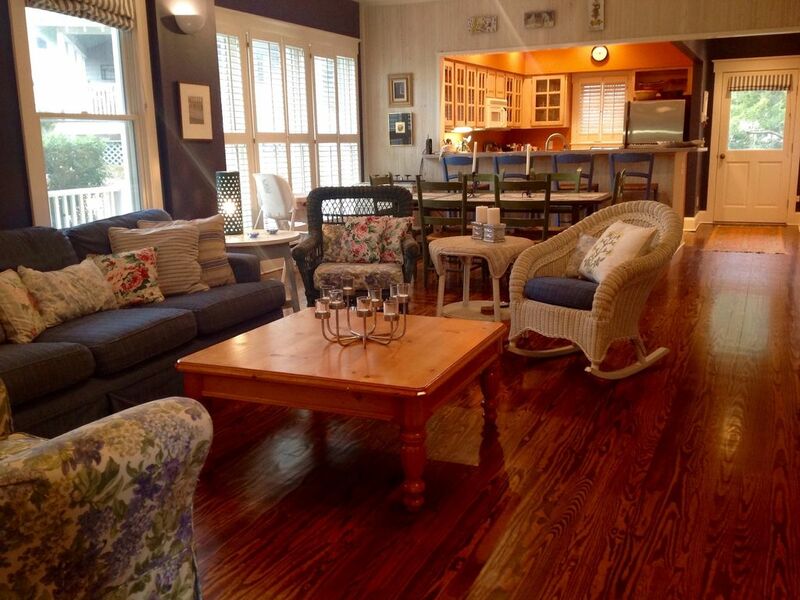 NOTE: If you are planning a large gathering of family and friends and need more space, the other side of our duplex is a beautiful 3 BR, 2.5 BTH house with a separate 1 BR, 1 BTH crofter, sleeps 10, and is also available for rent. See "Lost In The Light" (offered by Tiffany's Rentals on the island). My husband and I have been married for 30 years and have 3 children, all of whom have grown up vacationing in this home on Bald Head Island. We have dedicated renters who return year after year. Everyone takes wonderful care of our house! My husband and I bought a beach house on Bald Head Island because it seemed like the perfect place to create family memories for our children and grandchildren (hopefully, someday!). The kids were quite young when we got it. We wanted a home base for our family that would be with us throughout the career moves and stages of life. 18 years later, it is a decision we do not regret! The island is very secluded and relatively unspoiled. Contact with the outside world seems very limited, and we really lose track of time there. Its an extremely safe place, where our children can just take off in the morning and come back before dark, dirty and exhausted, ready for dinner and bed! Its good, clean fun, the old fashioned kind we grew up with; limited technology, lots of nature and active, outdoor time. Our kids would spend their days fishing, crabbing, clamming, surfing, biking, roller blading, playing touch football on the beach, and playing 'capture the flag' and 'ghost in the graveyard' in our neighborhood with the other kids staying there whenever we are there. Another favorite activity was setting up an old fashioned lemonade stand. Boy did they rake it in on a hot summer day! You are a short 100-200 yard walk to the neighborhood's private beach access via the neighborhood's private wooden boardwalk system. It is 5 minutes or less by foot to the sand. We are a short, 200 yard walk down to the beach via a private wooden boardwalk system for use by neighborhood residents only. You can see the ocean from the 3rd floor windows (sorry, but the vegetation shielding us from the road in front of us has now grown too high to see it from the 2nd floor deck). (4) There is a telephone on the first and second floors. There are two systems; one controls the temperature on the 1st floor and the 2nd controls the temperature on the 2nd and 3rd floors. Both systems are regularly serviced. Our home is fully winterized. We use a laundry service that provides high quality white sheets and towels, including bath sheets, that have been commercially laundered and sanitized prior to your arrival. Full sized washer, new Spring 2016, is on the 1st floor in a laundry closet adjacent to the kitchen. Full sized dryer, new March 2011summer 2018, is on the 1st floor in a laundry closet adjacent to the kitchen. There is a fireplace but renters are prohibited from using it to build fires due to safety concerns. No cars are allowed on BHI. We get around the island on foot, bicycle or in a golf cart. We provide two carts for your use when renting our home. Cars are parked in Southport at the ferry. We have a one-cart garage. The second cart sits in the driveway. free password protected high speed wi-fi via cable modem. We do have beach towels you are welcome to use if you do not bring your own. The BHI Club has a very nice, well equipped multiroom fitness center which you may use. Wi-fi is provided free to renters via a router/cable modem combination apparatus on the first floor. Electric smooth glass top stove/oven combo with four burners. Electric oven with self clean function. Microwave installed in cabinetry above stove; new spring 2016. Rotating glass turntable and upper removable shelf. Vent fan and stove light. 12 cup capacity drip coffee maker and french press. Bean grinder as well. Fully stocked with plenty of china plates, bowls, mugs, and glassware, including high quality wine glasses! We have a very well stocked 'cook's kitchen' with high quality pots and pans, ample dinner and glassware, and a large variety of cooking utensils and tools and small appliances. Dining table seats 6. 4 additional seats at the bar with bar stools next to dining table. Booster chair in closet. (4) We have 3 small flat screen tvs and one larger flat screen TV over the fireplace in the living room area. All have cable TV and 3 of the 4 are internet ready and can be used for streaming. (4) There are 4 flat screen TVs in the house with cable reception (living room, both 2nd floor bedrooms, and 3rd floor bedroom). The three TVs on the 1st and 2nd floor also have internet reception. There are 3 dvd players in the house. The house is well stocked with a large variety of paperback adult fiction, all suitable for taking to the beach, and a large bookshelf full of children's books on the 3rd floor. Scrabble, Monopoly, other board and card games. Mostly building toys like legos and toddler puzzles and games. Several jigsaw puzzles and board games. We have numerous DVDs, including many for children, available for renters to view. We also have internet ready TVs for movie streaming. There is a small balcony off the master bedroom facing south, toward the ocean, with a pair of reclining lounge chairs for sunbathing. You may rent kayaks and canoes on the island. You may rent small sailboats on the island. There are also sail and fishing boats for hire. We have a wrap-around porch with rockers. and a porch swing. We have a wrap around front porch and a small sun deck off the second floor master bedroom. You may rent surfboards and paddleboards on the island. There are boogie boards in our garage for your use. The BHI Club has tennis courts you may use with your BHI Club membership. You will have access to the Bald Head Island Club golf course (greens fees apply), a beautiful, recently renovated George Cobb designed 18 hole championship course with driving range. (2) We provide a membership at the Bald Head Island Club which includes use of their outdoor pools. We also will provide, upon request, a Shoals Club membership for an additional fee. This vacation home had everything we needed. We had 2 families (4 adults and 5 children) and it was the perfect size and space for our crew. Location was great and the owner, Nana, was super responsive and a joy! We will be back! Fabulous space, and practical, comfy furnishings. This is a very welcoming place, which we will come back to over and over again. Freshly painted and equipped with everything we needed for beach and relaxation. The place was great with all amenities, the host extremely accommodating, and BHI never disappoints! Nana's place is perfect. Just a quick walk to the beach and gorgeous views. Three floors and plenty of space to relax and sleep. The master bedroom is very comfortable and the shower is great! Will definitely be staying here again. This was our second time staying at the Milken House. The home is in a great location- across the street from the beach and close to the market. You can hear the ocean from the house and see it from the top floor. Our kids love having their own floor. The top floor has bunk beds and daybeds plus lots of toys and books. In addition the home has a crib, pack and play, high chair, rocking chair, kids' dishes and a huge DVD selection. It is great not having to bring those items along. We cooked all of our meals during our stay. The kitchen has everything you need and more. You will not be disappointed by this house. It is truly comfortable. Nana is wonderful to work with, she is very responsive to any questions or concerns. Nana was such a pleasure to work with on this rental. She is a great communicator - before and during our stay. We were one of the first guests to return after Hurricane Florence and she was diligent to ready everything for our arrival. She dealt with several issues rapidly and gave us information to set expectations. Would definitely return - house is comfortable and filled with interesting art; amenities and furnishings are everything a visitor needs; location is superb - close to beaches, forest and island activities; and the owner is amazing. Please contact us regarding the terms of our pet policy before booking, and note that the refundable damage deposit for those persons bringing a pet with them is $500, rather than $250. There is no "pet fee." The VRBO system isn't set up to allow for a higher damage deposit for pets, so it shows it as an additional $250 pet fee, but it will be refunded per the contract if no damage occurs. Also, the quote you receive from VRBO will not be exactly correct; we only require one-half of the BASE RENT upfront with the signed contract (which I will email to you after you send me your home address and let me know if you want a Shoals Club membership as well and whether you will be bringing a pet) and the remainder is due 30 days prior to arrival date. Payment is by personal check or PayPal (your choice).